How did it happen that unpretentious business strikes of a common coin, one with a mintage of 5 million pieces, became $10,000 numismatic superstars less than five months after the coin began circulating? This is not a trick question, nor does its answer involve mint errors or rare die variations. The coin is South Africa’s 2008 5 rand commemorating former president Nelson Mandela’s 90th birthday. Released into circulation on July 18, 2008, many of the coins soon appeared in the offices of Professional Coin Grading Services and Numismatic Guaranty Corporation, two graders favored by South African collectors. As I write in mid-December, only six examples have been graded as high as MS-68, all by PCGS. Three of these recently sold for R100,000, or about US$10,000, per coin. A partial explanation for this price level lies in the coin’s theme. Every South African Mint product associated with Mandela enjoys extraordinary popularity in South Africa and, to a growing extent, around the world. 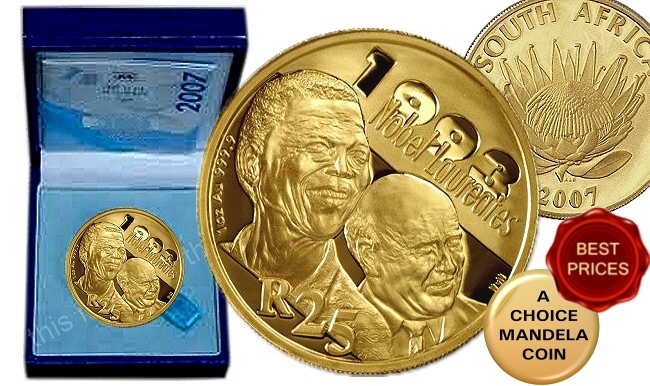 The 90th birthday issue joins a family of similar coins, namely, the 1994 Mandela presidential inauguration R5 and his post-presidential 2000 R5, whose rates of appreciation in the numismatic market make them top performers globally. Of all coins ever minted anywhere, the 2000 R5 has the steepest curve of increasing prices. No other coin comes close. South Africans have been hoarding the new R5 since July 18. Anticipating this behavior, the South African government tried to forestall it. Reserve Bank Governor Tito Mboweni and Finance Minister Trevor Manuel practically begged the public to keep the coin in circulation. Of course, South Africans didn’t comply. The resulting hoards have an important bearing on the value of MS-68 examples. High percentages of the total number of coins minted remain uncirculated or almost uncirculated. This permits numismatic experts to discern the extreme rarity of superb business strikes. An inordinately small proportion of superlative pieces emerged from the mint. We arrive at the root cause of the $10,000 price tag for MS-68 specimens when we understand why the South African Mint, whose technical prowess in world class, didn’t produce a greater quantity of nearly perfect coins. The coin’s planned intricacies and the techniques required to execute them were challenging. Like mints in the U.S. and Canada, the South African Mint proved unable to devote the resources necessary to master these challenges and produce consistently excellent “mere” business strikes. To have done so would have been prohibitively expensive. A bimetallic coin, the Mandela 90th birthday R5 entailed more difficult strikings that would have been the case if planchets of uniform alloy had been used. The South Africans resorted to the bimetallic planchets – brass-plated steel centers with nickel-plated copper rings – that they had introduced for their R5 in 2004. Moreover, and in the contrast to the 1994 and 2000 Mandela R5s, the 2008 coin was designed with a quantum leap of finer detail. This is especially evident on the coin’s reverse (what Americans would call its obverse) where Mandela’s bust dominates the center. In the ring and radiating from the center on both Mandela’s right and his left are incredibly minute renditions of the letters “SARB” standing for the South African Reserve Bank. Mint employees surely suffered fits trying to keep this tiny lettering sharp. Fine detail also appears on the obverse where the South African coat of arms is markedly more elaborate than the wildebeest design of 2000. To my mind, the coin’s most demanding feature is its reeded edge with a security groove bifurcating the reeding. Inside the security groove appear repeated incuse runs of the letters “SARB R5” denoting the reserve bank and the coins denomination. Getting all of this right and minting reasonably attractive business strikes makes the paucity of MS-68 pieces unsurprising. Collectors should feel grateful that there are any such examples. Price differentials attest to the scarcity of the MS-68s. Whereas three of these have fetched R100,000 apiece, the relatively common MS-65 routinely retails for R750, about $75. The Mandela 90th birthday R5 is exciting in itself, regardless of the potential to profit from it. It honors a statesman whose reputation is unsurpassed by those of his contemporaries around the globe. His coin will continue to be coveted collectibles. Perhaps the 90th birthday coin will prove more popular than the famed 2000 Mandela R5. I entertain the suspicion because of a consideration that most South Africans probably take for granted and non-South Africans are prone to ignore. Study carefully both sides of the coin. Notice the absence of the words ”SOUTH AFRICA.” The English-language name of the country isn’t present on all of its coins. South Africa has 11 official languages, and the mint rotates their use on coins.